I had grown up on stories of the exploits of our of WW2 diggers in the Kokoda campaign in Papua New Guinea and on stories of the Leahy Brothers adventures in the remote regions of this mysterious country. But what really got me interested in PNG were the stories of Tom Cole, the Crocodile Hunter. Tom’s stories about is his life in the Northern Territory and later in PNG fascinated me, they were stories passed on by my Uncles who lived and worked in the top end when I was a little boy. It wasn’t until 1993 when I first read Tom’s books that I realised this was the man, the living legend, who’s adventures I had grown up on. I was fortunate meet Tom and get to know him a bit in the last few years of his life, a friendship I will always remember. In 1983 one of my businesses was manufacturing security training equipment and I jumped at the chance to travel to PNG to sell my products to the police department and to the security companies that were flourishing in a violent time. When my Taekwondo Master heard I was going to PNG he asked me if I would conduct some seminars for our affiliated clubs in Port Moresby. So my first contact with the Koiari people was through Thomas our Port Moresby Taekwondo Instructor, of course I didn’t realise at the time how important the Koiari connection was to be in the future. 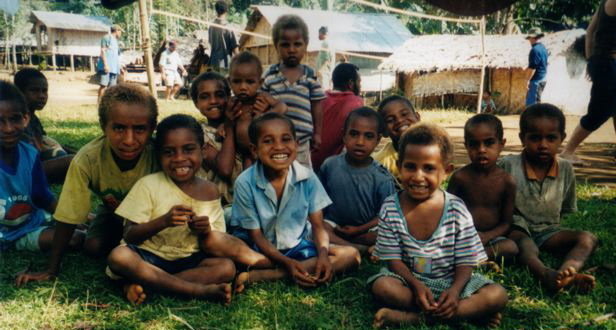 I travelled to PNG several more time between 1983 and 1995 developing a firm link with PNG, and the local people, seeing some of the country and even taking a drive to Owers Corner in 1985. In 1995 I trekked Kokoda for the first time and met Colin Obed. Although Colin was a porter on my first trek, it was the Taekwondo connection that first brought us together and cemented the friendship that was later to bring us together as business partners. Through Colin I have since had the privilege of getting to know and call friends so many of the wonderful people of the track, particularly from the villages of Naduri, Efogi and Menari. Through these friendships I have learnt a lot about the people and heard the stories of their lives along the track. Not just the stories of the Wuzzy Wuzzies and the battles but about life in the villages before the war, before the missionaries when the Koiari were known as fierce warriors. Stories of their fighting methods and weapons and of the raids on other villages to take women. About their tree houses and traditional foods and medicines and of the sorcery. Of the changes to their way of life as the Seventh Day Adventist religion came to the villages. Stories of how the old, the women and the children hid in fear in the jungle to keep away from the Japanese. Of their hardships and the struggle to find food while the able men of the villages were away. I have learnt of life along the track after the war and after Independence in 1975, of the hardships of life in Port Moresby as more and more of the young men of the villages moved to the city looking for work. Of their sharing and caring nature and how family is everything, how the young respect the old and of how little possessions really mean. We, westerners with our materialistic lifestyles and focus on finance have so much to learn from these wonderful people and from this amazing country. I hope that when you trek Kokoda with us you will go home with an appreciation not just of the Koiari people, of the Kokoda Track and the country of Papua New Guinea but of what you have in your own life and in particular an appreciation of what should be most treasured in life, your family and friends. Want to hear more? Better check Trek Dates and make a booking. Hope to hear from you soon.